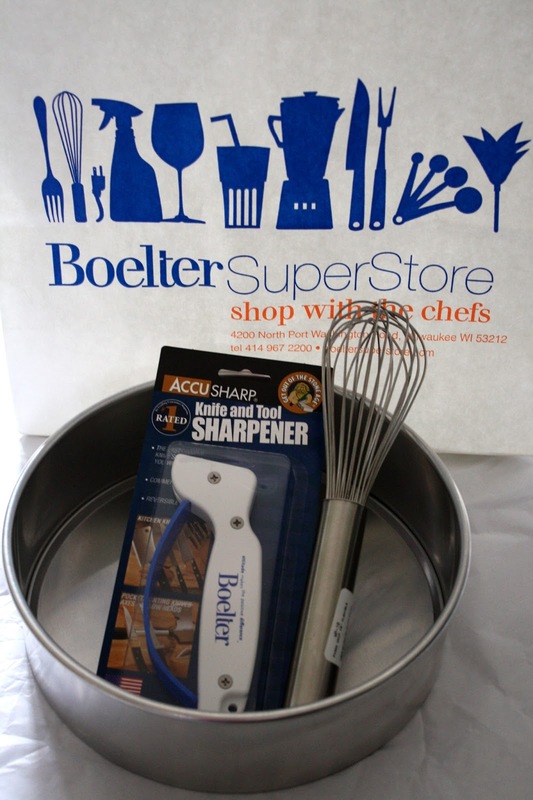 Karis and I went to our first cooking class at Boelter SuperStore yesterday. It was taught by Chef Feker from Il Mito and the theme was Eating Local-The New Exotic. The class was $35 (for one hour of time) and included a $25 gift certificate for the store. 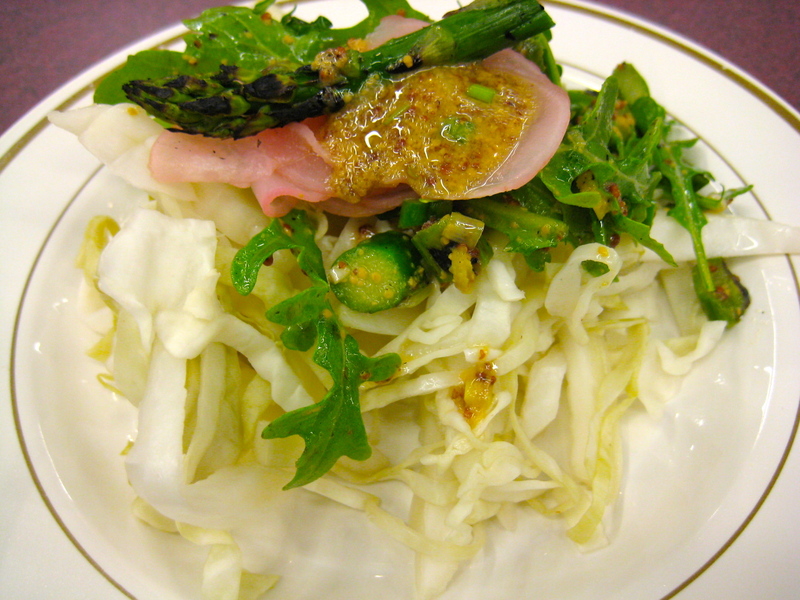 Chef Feker cooked a Quick Pickled Radishes and Cabbage with Spring Asparagus and Arugula Salad. It was delicious, light and refreshing and I hope I can make this at home sometime this spring. 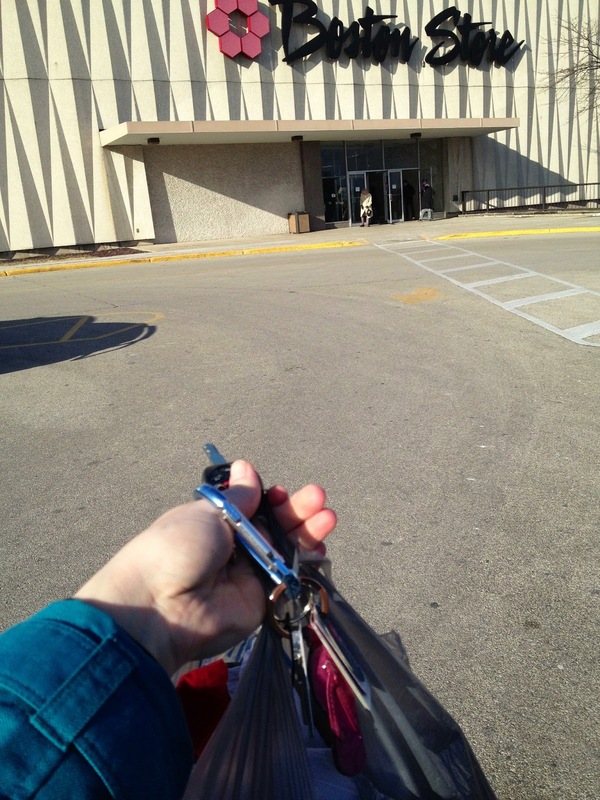 I really enjoyed walking around the store after class and found three things to purchase: a knife sharpener that was recommended during class, a whisk, and a springform pan. Boelter has more classes coming up, so check them out online if you are interested in attending one. Our cooking class was part of a Meetup.com Cooking in the City group meetup. 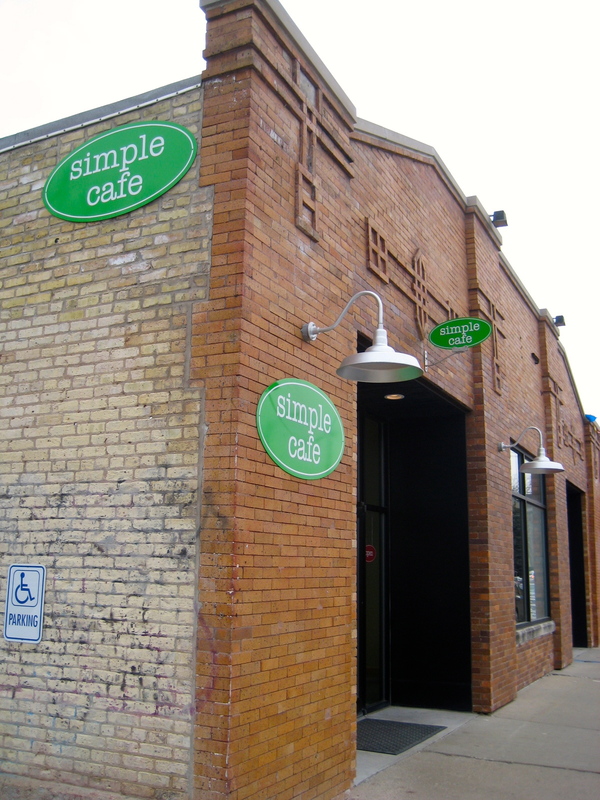 After class, Karis and I went to Simple Cafe on the East side with Carrie from the group. I enjoyed Apple Crumble French Toast and it was fantastic. Karis ordered pumpkin pancakes and Carrie got a turkey hash. I can't believe the weekend is already over! Luckily, I took off on Friday and I have a four day week ahead of me. The kitties celebrated their 7th birthday on Saturday! Their birthday presents were extra cat treats, a visit from Grandma and boxes from my Sam's Club trip, which pleased them immensely. I heard about this book on NPR and really want to read it soon. The list of books I want to read just keeps growing. I'm so lucky I can usually get titles from my local library right away and I was able to put this one on hold already. I played paparazzi while my mom came out of Starbucks. Mom had a coupon for a free Caramel or Hazelnut Macchiato. I tried the Hazelnut one last weekend and urged her to get the Caramel, so she did. I enjoyed this flavor much more. Love having a pile of new magazines to read! Now I just have to be good about getting through these more quickly, otherwise they start to pile up. 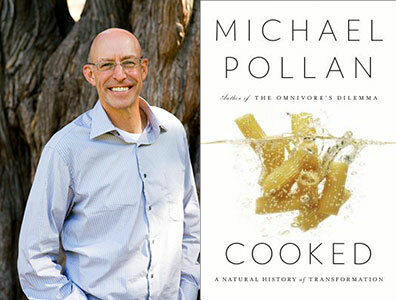 Thanks to Karis, I learned that Michael Pollan is coming to Milwaukee on Monday, April 29th and the tickets include a signed copy of his new book. Naturally, I signed up right away because I was not going to miss seeing him this time. Last time he was in town, his event sold out quickly and I never got tickets. Hope your weekend was great and your week is even better! 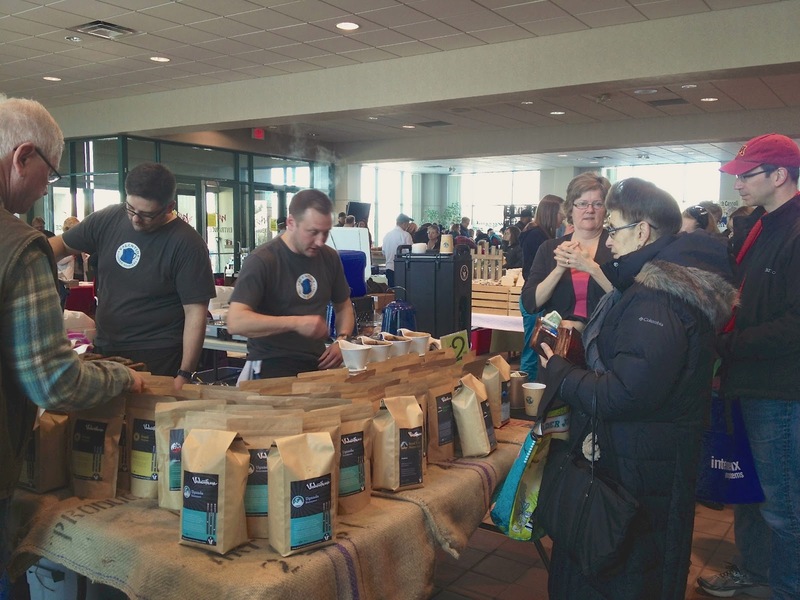 My mom and I visited the Milwaukee County Winter Farmers' Market on Saturday morning. I had only been once before and I really enjoyed the selection of vendors much more this time! 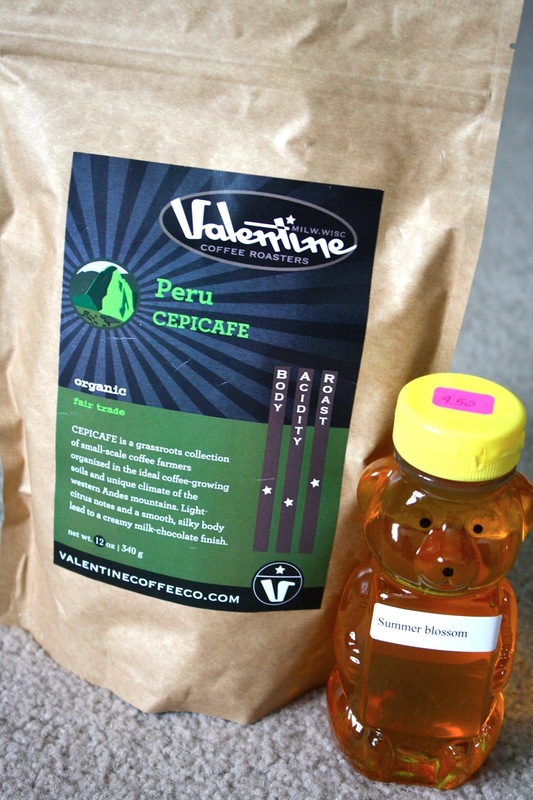 I purchased a bag of Valentine coffee (made in Milwaukee) and some honey, made locally in Hales Corners. The Valentine booth was busy the entire time! I chose the Peru Cepicafe and with my purchase, a cup of coffee was included. I didn't add cream or sugar and it tasted delicious. Unfortunately, I didn't buy any produce, I just looked at things like root vegetables. I cannot wait until the West Allis Farmers' Market is full of farmers and fresh food! My mom purchased a lotion bar from Soap of the Earth, a company based in Whitewater, WI. When I need to stock up on some soap or natural insect repellent, I am definitely getting some from Soap of the Earth! I loved smelling of the soaps, especially any lavender based ones, but all of them smelled wonderful. 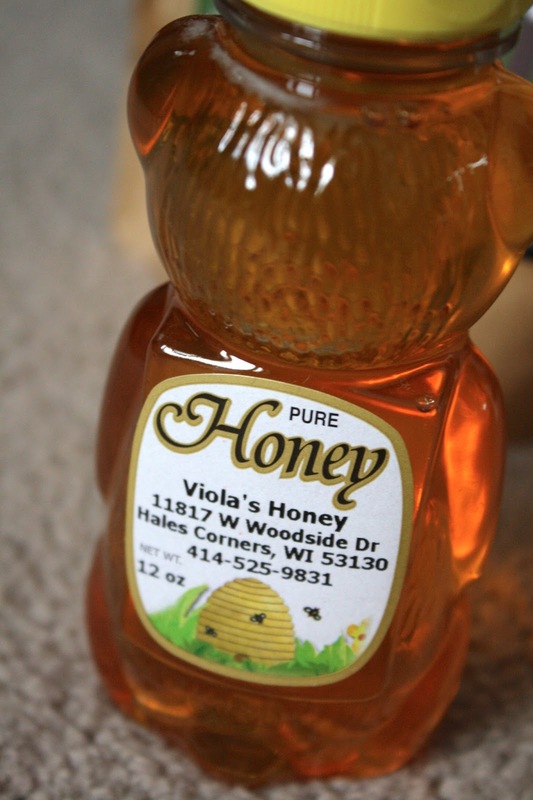 If you live in the Milwaukee area and haven't been to the Winter Farmers' Market, get there soon! The season ends on April 13th. Hours: 8 a.m. to noon. Earlier this week, a co-worker commented to me, "aah, to be that age again" while he looked over at a group of carefree German exchange students who were visiting my work. I thought to myself, "nah, I wouldn't want to be" and then I said it out loud to him in reply to his statement. I am perfectly content being 32. My student loans are almost paid off, I am happily married and just satisfied with life in general right now. According to a recent study, people are happiest at the age of 33, which is what I will turn this August. For fun, I thought I would share some photos of a younger me. I have to say, that I did enjoy being somewhat carefree from the ages of 5-11 or so, but I did resist authority and wanted to be independent about certain things (typical youngest child I guess). Here I am with my niece Kristine (I am the youngest of 7 kids so that is how I can have a niece close in age to me) at the Wauwatosa 4th of July parade. 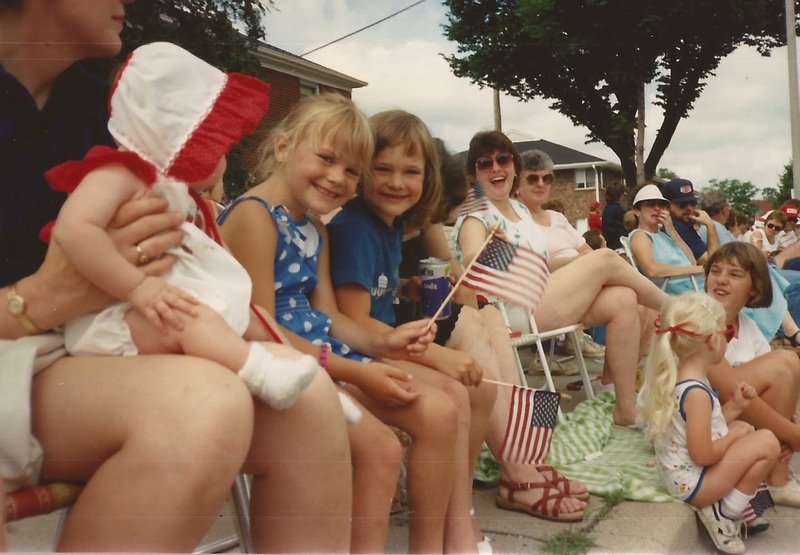 This is one tradition I always enjoyed and I think for a while there, the 4th of July was my favorite holiday because of this parade and because I could put little American flags out in our yard and flower box. 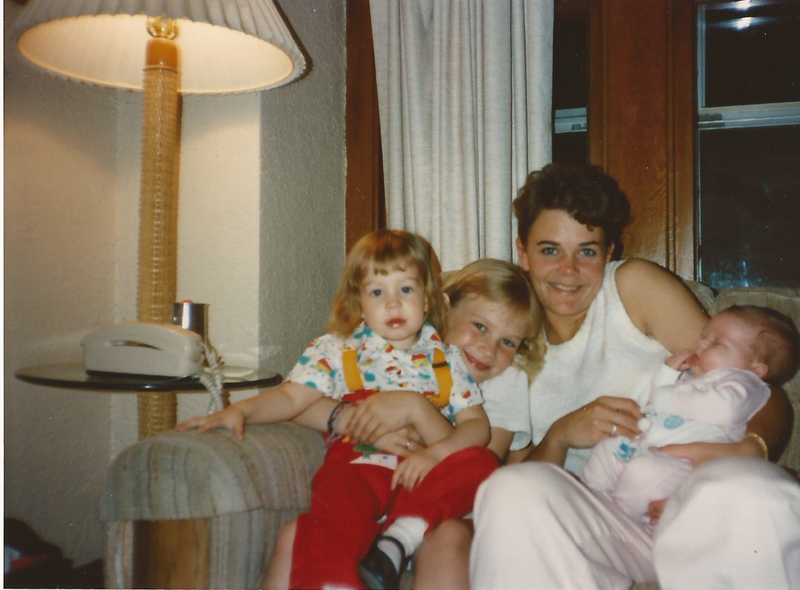 My niece Sarah, me, sister Laurie and niece Kelli. 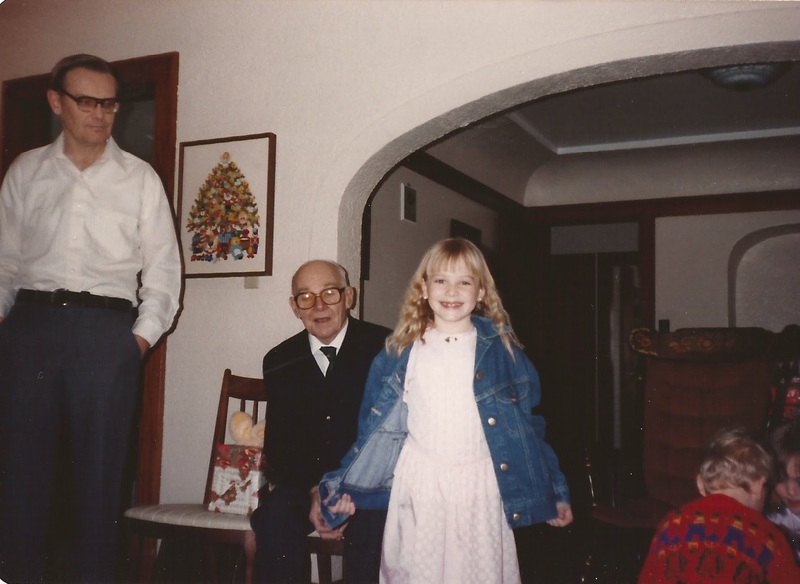 My dad, Grandpa Schmitt and me. Sadly, my Grandpa passed away not long after this photo was taken and seeing my grandparents in photographs always brings me to tears. I wish they hadn't passed away when I was so young. 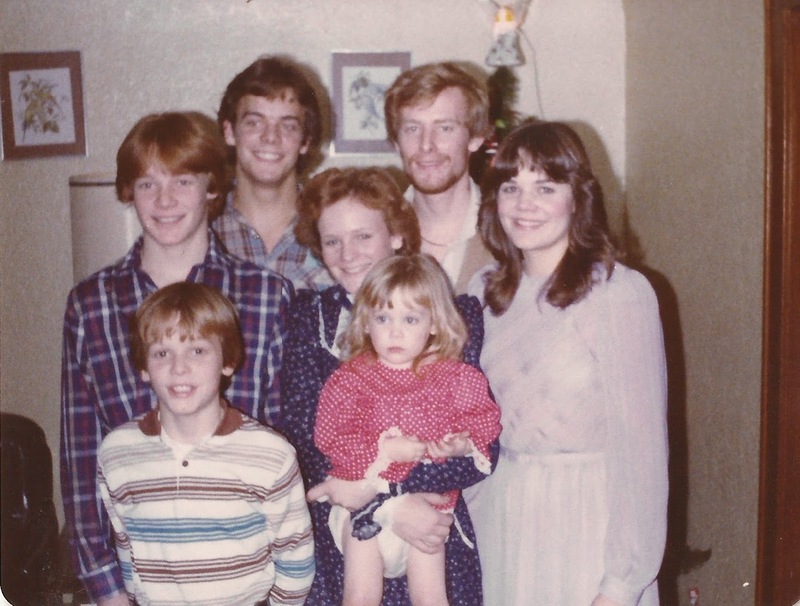 All 7 of us siblings together at Christmas time! We moved from Wauwatosa to New Berlin when I was 8, almost 9. Here I am shortly after that move, doing who knows what. 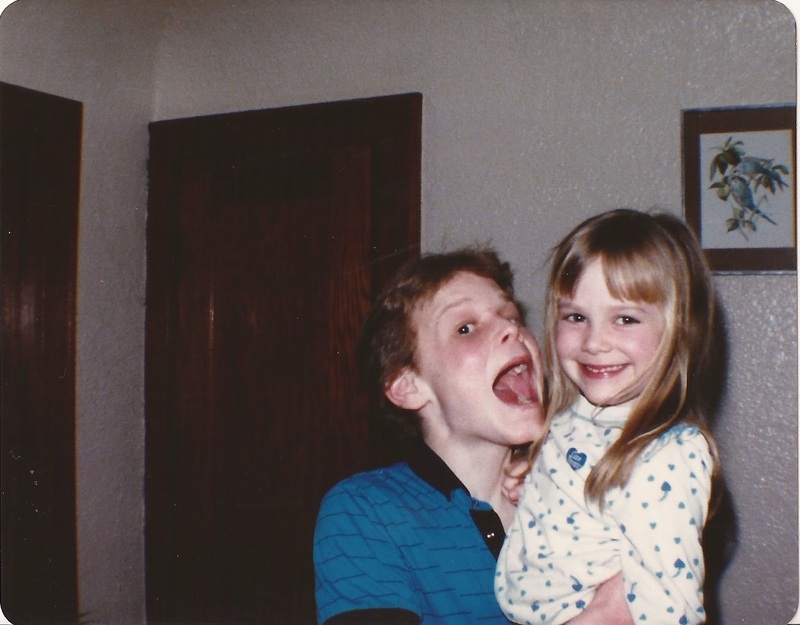 My brother Brian and I. This photo reminds me of the faces his sons now make in pictures I take of them. 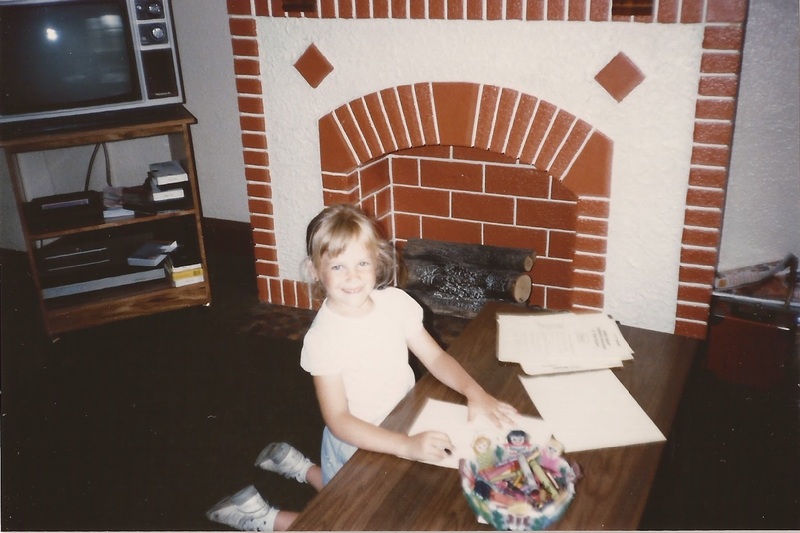 Me coloring at our house in Wauwatosa. 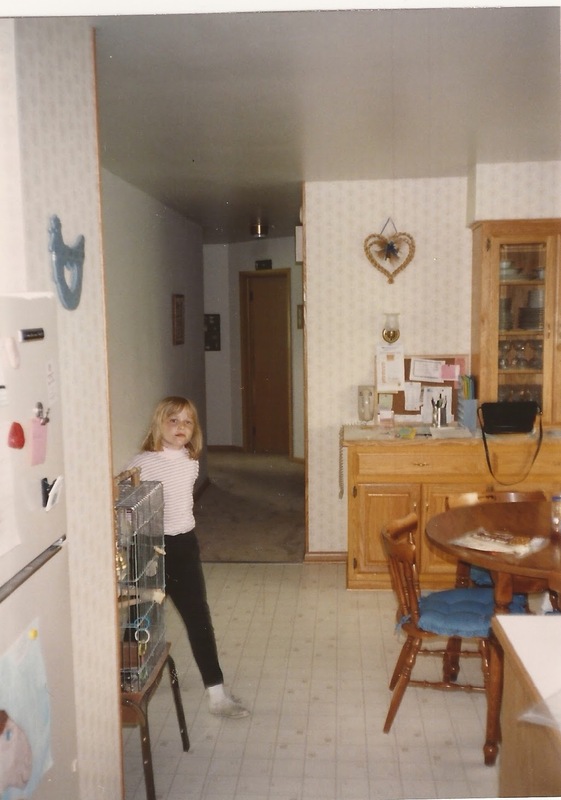 I loved that crayon container. My grandma made it for me. Any readers out there 33 and feel totally content with their life right now? A person enamored of everything involving the country of Germany. Holds similar enthusiasm to a francophile but is considerably less annoying. Amber: I just wrote a paper on Uncle Tom's Cabin. Dan: Oh, that's nice. There is a train station in Berlin called Onkel Toms Hütte. Amber: Oh, Dan. You're such a deutschophile. I am a true deutschophile. I received mail from Germany that addressed me as "Frau Lisa" and it made my day. Maybe I was just happy to be done with my daily e-mails to Deutsche Bahn. I am such a deutschophile that I saw them as a challenge (to speak a bit of German) instead of an annoyance. I have to admit, if it were any other country, I'd have probably been way annoyed (because I was frustrated with the bureaucracy and daily confusion when I lived in Switzerland). Luckily, the e-mails were worth it as the pass appears to have arrived with all of the information "sehr perfekt." I can't wait to explore more of Germany with that rail pass, particularly cities I have not been to before like Rothenburg ob der Tauber, Freiburg, Baden-Baden and Heidelberg. Are you enamored with a certain country and why? For me, I think it's just that Germany feels like home. I did feel very much at home in Switzerland too, but I think I would have been better off in the Swiss German region than in the Swiss Italian one. I felt like breaking out the iPhone and DSLR cameras this weekend to capture what I was up to. I worked until nearly midnight on Friday evening, so it was nice to wake up to these guys on Saturday morning. Surprisingly, we were all in a really good mood. I am usually quite cranky and tired after working so late and being on my feet a lot. My first bulu box arrived on Saturday morning. More on my impression in a future post. The kitties liked checking out my box and sniffing all around it. I used a Living Social deal to join Sam's Club. After we were tired from walking around there, we headed to Starbucks. Craig got a White Chocolate Mocha. 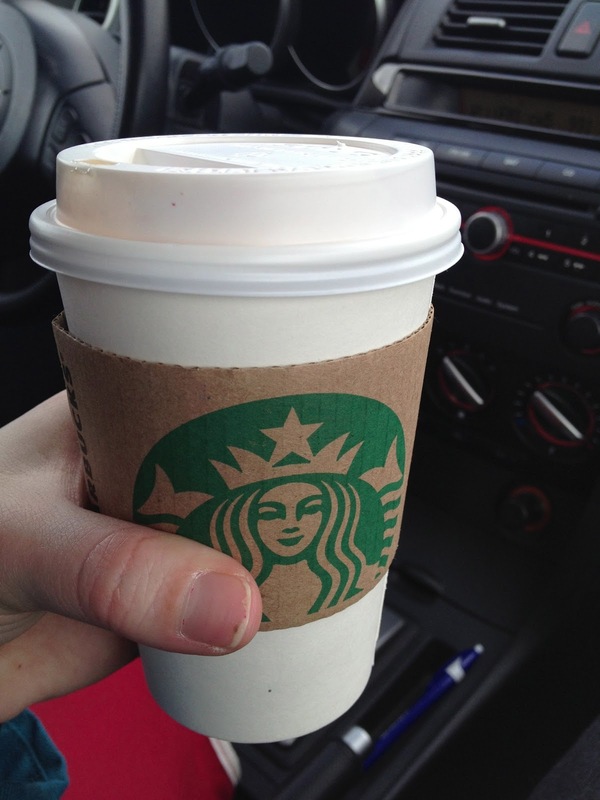 I had a 50% off coupon for any drink, so I tried the new Hazelnut Macchiato. It was just ok. I wouldn't get it again. Karma proceeded to be his silly self by cleaning his nails and rolling around the floor. Donated some clothes to Goodwill in exchange for Boston Store coupons. Per usual, I didn't buy a thing with those coupons. Then it was time for sushi with my friend Danielle at Ginza in Wauwatosa. I started out with veggie tempura. I should have gone with the avocado salad, which Danielle got. I find I really don't like greasy, fried foods much anymore. I had been craving vegetarian sushi for about a good month now. Fresh sushi is just so yummy! I checked out feedly over the weekend and am liking it more and more. I figured that I would start out using bloglovin', but still keep trying other reader sites. Karma and I are both ready for spring. I am happy the snow is melting more and more every day and he is happy to see birds flying again. He was watching a cute red one in the street right before I took this photo. I've been trying to use up beauty samples I get and because my hair has been feeling dry lately, I tried this mask out today. It moisturized nicely, but smelled strange. I finally used a coupon I had for a free Angelic Bakehouse product! I got the sprouted seven grain bread and promptly made a chickpea salad sandwich when we arrived home from errands. I really loved the seven grain! Karma likes to stalk Craig and I when we eat cheese. 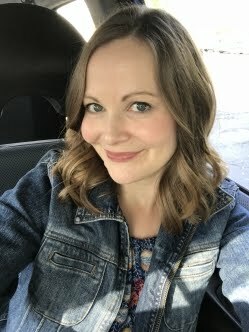 I tried out some arbonne products--the makeup primer and foundation. I think buff is the perfect color for me. I am not sure I am sold on how these products work with my skin though. After a workout tonight, I was really in the mood to bake and use up two bananas that were browning quickly. I made Banana Crumb muffins from My Baking Addiction. They turned out so delicious! I am looking forward to eating one as a snack at work tomorrow. It was a busy and fun weekend! Any exciting events take place in your world? The one thing I didn't get around to doing was reading a book. I did a bit of that before heading into work on Friday, but I really wanted to finish the book I am currently reading. I haven't checked in lately. I got sick with a bad cold last Friday and I literally spent all weekend inside the house. The good news is that I read about 10-15 magazines and recycled a huge stack/saved a bunch for my mom to read. The bad news is that I got Craig sick too and he's been home for the last two days. Workouts: I haven't been to the gym much, but I did get there for yoga class and some cardio/weights. Both felt great to do, except the sinus pain hit so badly when we did sun salutations in yoga class. Even walking on the stair stepper hurt my head and made me feel lightheaded. I am glad I didn't force myself to go when I was at my worst with this cold. Free time: Besides that, I've just been booking hotels left and right for our European trip because my mom and I leave two months from Saturday. Eek! I feel better now that we have those plans in place. 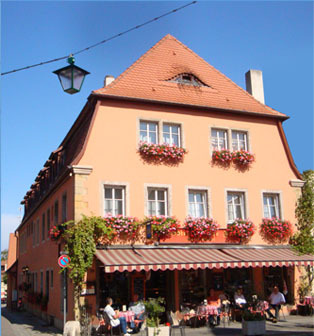 Our cute hotel in Rothenburg ob der Tauber, Germany. I better up my workouts now because this hotel is above a cafe with all sorts of baked goods. :) I can't resist German pretzels, potatoes and hazelnut desserts in Europe. Latest You Tube/blog obsession: I am not someone who watches a lot of videos on You Tube. I like to learn from videos posted on the internet, so I don't generally watch any for entertainment like Craig does. When I was sick, I discovered Essie Button the blog and You Tube channel. I already have a new perspective on makeup and brushes to buy (real techniques brand is what she seems to love), etc. I like that she mixes up using drugstore brands (some only available in England or on the internet) and more expensive brands. News: I am sure you heard by now...Google Reader is shutting down on July 1st and it seems like most bloggers are already turning to using another service. I looked at feedly and bloglovin' and chose to import all of the blogs I read to bloglovin'. Follow me here. I also downloaded the bloglovin' app for my phone and I like it so far. It was really easy to import all of the blogs from Google Reader over to the new site automatically. I hope you have a great Friday! I have to work tonight, so I am trying to make the most of my morning by being productive. Have you tried Larabar's über bars yet? I love the Roasted Nut Roll flavor! They were recently featured on The Biggest Loser and Jillian Michaels talked about the great ingredients they include, like dates, nuts and sea salt. If you haven't tried them yet, I've got 4 to give away today. Thanks Larabar! -Mandatory: tell me what you've been über excited about lately--a product, spring coming, a book you are reading, the snow, an upcoming vacation, etc.? Please include your e-mail address after your comment so I can contact you if you win. Giveaway ends on Sunday, March 10, 2013 at 9 p.m. CST. I'll e-mail the winner directly. If the winner does not respond within 48 hours, I will pick a new one. GIVEAWAY NOW CLOSED. Congrats to Mary Kate, commenter #3! I recently attended a "Super foods for super health" class at work, as part of our wellness program. 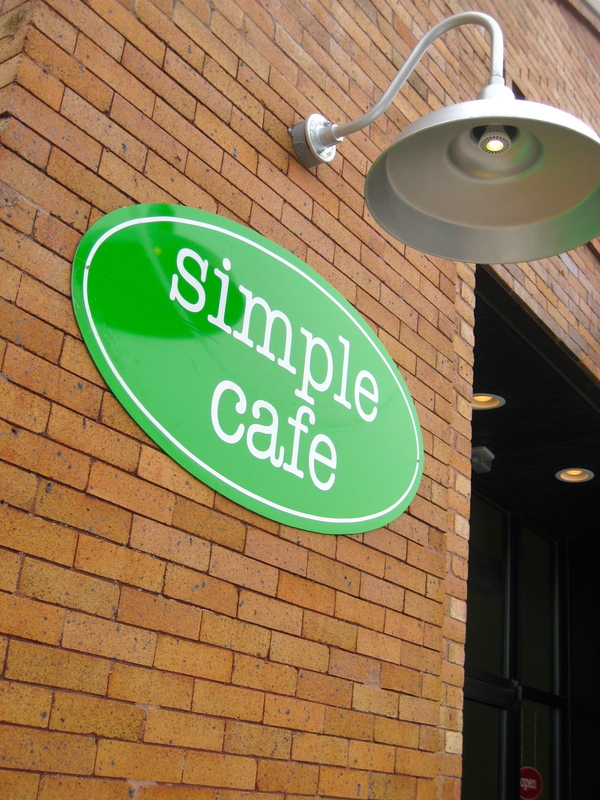 It was taught by a Registered Dietitian who mainly teaches corporate wellness classes. Listening to her made me wish I could go back in time and study Nutrition in college instead of History. I honestly got so excited learning about all of these foods and how they positively affect our bodies. Because of their disease fighting abilities, she considered the following all super foods and I am sure you can think of many more: avocados, blueberries, brazil nuts, broccoli, butternut squash and cantaloupe, edamame, flaxseed, kale and spinach, kiwifruit, lentils, onions, quinoa, sardines, tomatoes and yogurt. We learned more in depth information about the foods, like that blueberries have the highest nutritional profile of any fruit. They boost brain health, are high in fiber, prevent urinary tract infections, improve the effect of radiation therapy and are the best bang for your buck in terms of fruits. The RD said that the goal was to get 5 servings per day. I didn't realize it, but something like one small clementine counts as one serving. To fight cancer, it is recommended to get 10 servings per day. Sadly, the average American only eats 3 servings per day. I went to Trader Joe's this afternoon and picked up 7 foods off of the list (I forgot to add the tomatoes I purchased to the photo below). Before my trip to the store, I did write down a few of the foods I wanted to try that I wasn't sure I had before, like brazil nuts. On our way into class, we tried cashew and almond butters with crackers and a Black Bean salsa, all of which were delicious. One of the other big takeaways was the following: if you hate something like broccoli, unless you can only eat it with cheese sauce on top, eat it anyway. It's better to eat that food with something not so ideal on top rather than not eat it at all. If you don't currently eat any fruit, canned is better than none at all, but fresh is obviously ideal. I already ate a lot of the super foods we learned about. I will still remember the list every time I go to the grocery store or make a meal and will try to incorporate as many super foods into my diet as possible. What is your favorite super food? The only item I didn't like from the list was sardines. I had sardines when I lived in Switzerland, but I didn't care for them.